Outdoor Event Toilets for multi day events, weddings, charity and festivals. Portable toilets offer a great solution if you are hosting a party, small family occasion or large wedding reception, we will be able to provide you with a solution to fit the number of guests you are expecting on the day. Whether it be at your home, a venue, park or field we can supply the correct portable toilet solution for you. If your party is at your home, the extra portable toilets provides an alternative solution to your guests. It cuts down on waiting time and congestion and allows a more free access within your garden. It decreases guests having access to your home and the extra cleaning you might have after the function is finished. All portable toilets can be for short or long-term hire, we also offer same-day delivery and emergency services. If you require luxury toilets at your function we can also supply these. participants to ensure you have reduced queuing. We also offer Portable Urinal hire which again assists with queues. All the toilets are supplied with toilet paper, soap and blue additives and dependent on the duration of hire, kept clean for you. Our portable toilets are durable for all weather conditions, which allows easy cleaning and maintenance with heavy duty springs on the door to increase wind resistance and assure tight closure. All portable toilets come with working integral door locks for safety and privacy. We also offer same-day delivery and emergency services.All portable toilets can be for short or long-term. 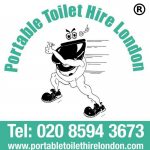 Please contact our dedicated team at Portable Toilet Hire London to discuss the requirements for your event and ensure that are fully satisfied and have all the information to hand for you to book your portable toilets for your function. The portable toilets are delivered to your location in London, Essex and the surrounding areas.